Gerard Manley Hopkins (July 28, 1844 – June 8, 1889) was a British Victorian poet and Jesuit priest. Hopkins sought and struggled to unite his spiritual yearnings with his love of poetry, and the resulting verse is some of the most unique in the language. Hopkins struggled to reveal what he called the "inscape" of ordinary things—the hidden world within the world, what William Blake elsewhere would call "infinity in a grain of sand / and eternity in an hour"—and the resulting poems are charged with wild, almost incantatory power that are unlike anything else in English literature. His poems are best understood when read aloud. Hopkins was born in Stratford, Essex, as the eldest of nine children of Catherine and Manley Hopkins, who was an insurance agent and consul-general for Hawaii based in London. Gerard Hopkins was educated at Highgate grammar school and then Balliol College, Oxford, where he studied classics. At Oxford he forged the friendship with Robert Bridges that would become important not only to Hopkins development as a poet but also to his posthumous acclaim. Although Hopkins began his time at Oxford as a keen socializer and prolific poet, something about his own youthful behavior alarmed him so much that he became devoutly studious and began to record his sins obsessively in his diary. 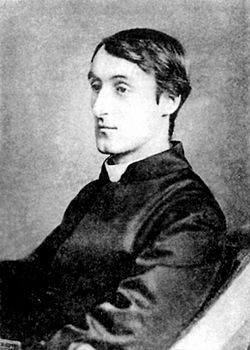 In 1866, following the example of John Henry Newman, Hopkins converted from Anglicanism to Roman Catholicism, and upon his graduation in 1867 accepted a teaching post that Newman had found for him. In the following year Hopkins decided to enter the priesthood. Hopkins health turned considerably for the worse while teaching in Dublin. Although he attempted to write, he only managed to produce fragments. For several years he convalesced, suffering from typhoid fever. He died in 1889 and was buried in Glasnevin Cemetery, Dublin. Hopkins is notoriously difficult to classify. Due to his innovations toward meter, Hopkins can be seen as anticipating much of free verse, although unlike true free verse poets, Hopkins retained a (loosened) adherence to rhyme and measure. His work has no great affinity with either the Pre-Raphaelite or Neo-Romanticism schools of his time, although he does share with them a descriptive love of nature. He is often seen as a precursor to modernist poetry or as a bridge between the two poetic eras. He is unique in his own time or any other. During his lifetime Hopkins published few poems. It was only through the efforts of Robert Bridges that his works were preserved and made public. Hopkins burned all his poems upon entering the priesthood, but he had already sent some to Bridges who, with a few other friends, were the only people to see many of them for some years. After Hopkins' death they were distributed to a wider audience, mostly fellow poets, and in 1918, Bridges, by then poet laureate, published a collected edition. History of "Gerard Manley Hopkins"
This page was last modified on 19 June 2017, at 18:25.